Later tonight the Yankees will look to complete the three-game sweep of the Red Sox and win their ninth straight game overall. They already have one nine-game winning streak this season. Now they’re one win away from a second nine-game winning streak, and it’s only May 10th. Pretty awesome. Here are some links and notes to check out prior to first pitch. 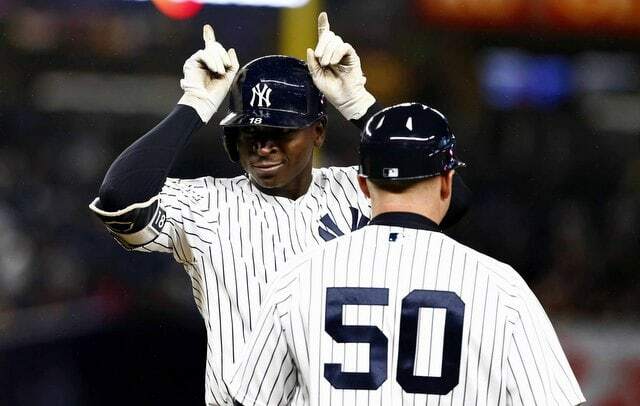 During a recent YES Network interview (video link), Brian Cashman said that during the 2014-15 offseason, the Yankees tried to get Didi Gregorius through multiple teams in a three-team trade, including the Rangers. Cashman couldn’t find a direct match with the Diamondbacks, so the Yankees engaged other teams and basically said “if you can get us Didi, we’ll give you Shane Greene.” The Rangers, who wanted Greene, couldn’t make it work but the Tigers did. Gregorius, even while mired in an 0-for-18 slump, is currently hitting .291/.382/.622 (159 wRC+) with ten home runs this season. He’s emerged as a true heart and soul player for the Yankees. At this point, no matter what happens from here on out, I think it’s safe to say the Gregorius deal will go down as one of Cashman’s best trades. Doesn’t matter whether they got him from the Tigers or Rangers or straight from the D’Backs. Didi replaced Derek Jeter seamlessly and he quickly became a cornerstone player on a contending team. Last night right-handed pitching prospect Jonathan Loaisiga, my preseason No. 17 prospect, made his second start with Double-A Trenton, striking out eight in five innings of one-run ball. The 23-year-old has a 1.50 ERA (1.59 FIP) with 31.4% strikeouts and 2.5% walks in 30 innings across six starts with Trenton and High-A Tampa this year. Loaisiga pitched at 94-96 mph in his five-inning outing, with some downhill plane to it, and even bumped a single 97. His slider was sharp at 85-87, and he threw a more curveball-shaped breaker at 82. He’d been mostly curveball last year, so I think these are two distinct pitches, with the slider either new or just massively improved … His changeup came in at 86-89 and some had splitter-like bottom, while others turned over more like a straight change, but all three pitches were comfortably above-average and flashing plus … There are some reasons to question his ultimate role, including the delivery and his size, but that’s a starter’s arsenal and more than enough feel and control right now to project him there. The Yankees signed Loaisiga out of a tryout camp a few years ago, after the Giants released him due to injuries, and he’s since overcome Tommy John surgery to work his way onto the 40-man roster. I think Loaisiga has top 100 prospect caliber stuff, though his injury history may keep him off the midseason lists, which is fine. Who cares. Prospect lists mean nothing anyway. Loaisiga is legit though. What a find by the Yankees. 23. Triston Casas, 1B, American Heritage School, Plantation, Fla.
It’s sounding like the Yankees want to go after a hitter at No. 23. The major league team currently has some of the biggest sluggers in baseball so maybe they’ll try and replicate the success of Aaron Judge with Triston Casas, who has an imposing frame, a patient approach and serious raw power. Georgia catcher Anthony Seigler might start to be in play in this range as well, as scouting director Damon Oppenheimer has seen him multiple times. Baseball America had the Yankees selecting Casas in their previous mock draft as well, though that was released several months ago as an early draft preview. The interesting nugget here is the Yankees apparently want a position player in the first round. For what it’s worth, former Yankees staffer Kiley McDaniel said in a recent chat he’s also heard the Yankees want a bat. Hmmm. The farm system is heavy on pitching right now, though I doubt the Yankees are looking to draft for need in the first round. Hard to project what you’ll need three or four years down the line, you know? Assuming this reports are true, chances are the Yankees just like the available position player talent more than the available pitching talent in the weeks leading up to the draft.